There is more than a little "let them eat brioche" in the blind faith that the masses' patience for pillage is infinite. We've reached an interesting moment in history where we each have a simple choice: we either go with blind faith or we go with the bottom line, i.e. the facts of the matter. So far, 2019 is the year of Blind Faith, as the charts below illustrate: the bottom line no longer matters. Let's start with the Ray Dalio Effect, which strikes financiers who've exploited our rigged system to skim billions while creating zero goods and services or public good: discerning that the millions whose labor has created the actual goods, services and public good will eventually tear down his Bastille of ill-gotten wealth stone by stone, Mr. Dalio rigs a corporate media appearance (the door is always open to billionaire financiers) to weep alligator tears while decrying the very system he exploited and suggesting we throw a few more crumbs to the mob to distract them from the awareness that his billions were ultimately skimmed from the wealth they generated. Nice timing, Mr. Dalio: It's awfully convenient of you to decry the system you helped create after you've skimmed your ill-gotten billions rather then before. 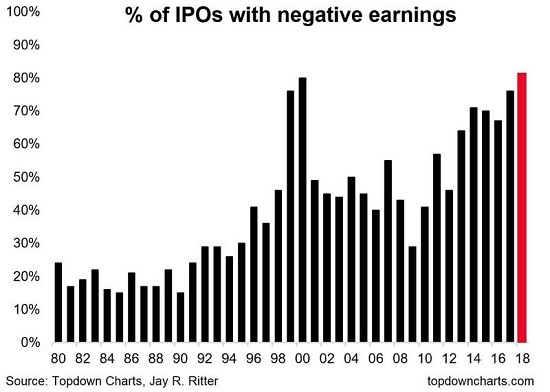 Then there's the blind faith that nose-bleed stock valuations can only go higher. 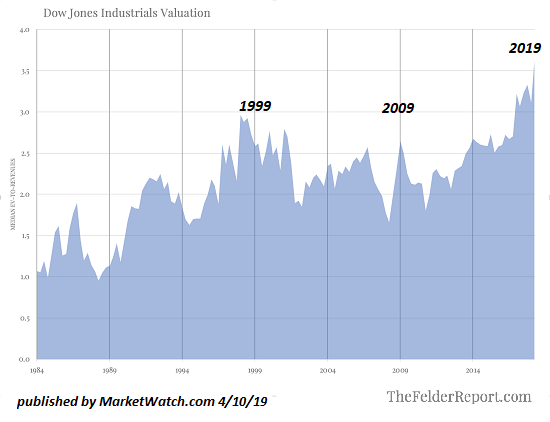 Courtesy of The era of ‘price-insensitive buying’ has led to this troubling chart(MarketWatch), here's a chart of the valuation of the Dow Jones Industrial Average (DJI), which now exceeds the insane extremes of the dot-com bubble circa 1999-2000. Blind faith was the punter's choice in late 1999-early 2000 as well. The bottom line no longer mattered. 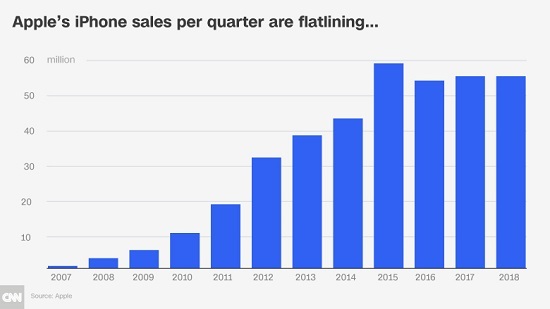 Then there's the little spot of bother with everyone's favorite object of blind faith, Apple: iPhone sales have flatlined even as Apple slashes prices in weakening markets. So what does Blind Faith do? Bid up Apple shares 40%. 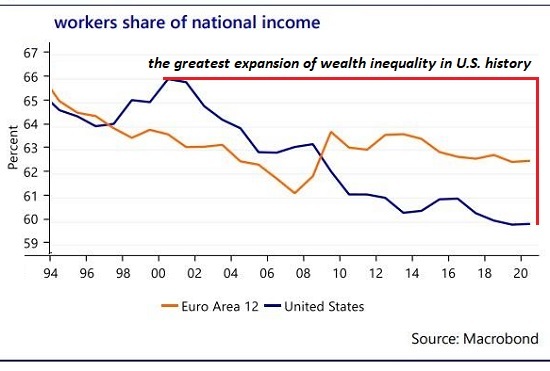 Meanwhile, in the real world of people creating wealth with their labor, workers' share of the national income has cratered while the financiers piled up their billions. The greatest expansion of wealth in U.S. history has created the greatest expansion of wealth inequality in U.S. history. There is more than a little "let them eat brioche" in the blind faith that the masses' patience for pillage is infinite. 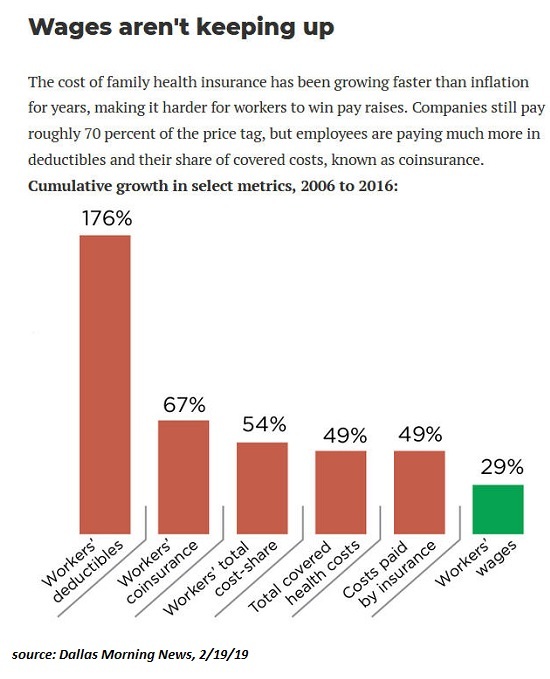 Here's a chart of healthcare-related costs and wages. Note the healthcare costs have soared far above the meager wage increases, which means disposable income has cratered. Rents, childcare, college tuition and local taxes/fees have similarly outpaced wages. 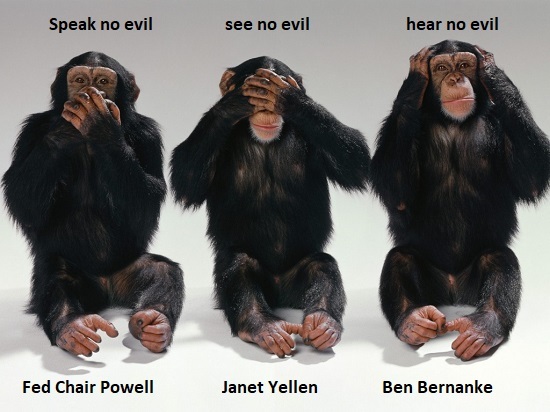 So by all means, put your blind faith in the Three Monkeys and ignore the bottom line. These monkeys agree with Marie Antoinette, "let them eat brioche". Thank you, Robert M. ($50), for your superlatively generous contribution to this site -- I am greatly honored by your steadfast support and readership.